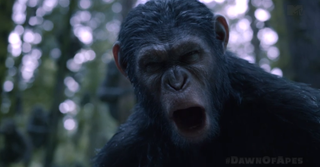 Humans trespass onto ape land in the first clip from Dawn of the Planet of the Apes, and what they encounter is frightening. A swarm of apes is ready to face them, led by a booming-voiced Caesar. The sequel to Rise of the Planet of the Apes is looking intense so far, and we're excited to see more of the growing ape culture and these encounters with humanity. Dawn of the Planet of the Apes hits theaters July 11.